One effect of chronic alcoholism is the damage that long-term heavy alcohol consumption does to the brain. Certain regions in the brains of alcoholics shrink, creating lesions that result in deficits in brain function. 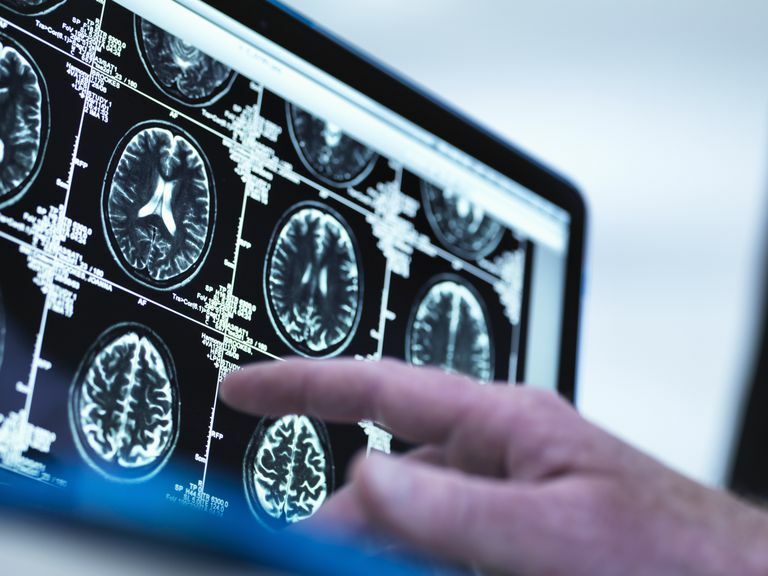 Brain imaging research has shown that the prefrontal cortex (in the front of the brain) and regions of the cerebellum (in the lower back of the brain) are particularly vulnerable to the effects of long-term alcohol abuse. This means that heavy alcohol use over a long period of time will damage regions of the brain that control executive function (the prefrontal cortex) and balance and postural stability (the cerebellum). Therefore, chronic alcoholics can progress to the point that they no longer have the ability to walk a straight line even when "sober" or stand on one foot, especially in the dark or when their eyes are closed. Additionally, long-time alcoholics can develop deficits in the executive functioning of their brains, meaning they can demonstrate problems in putting items in order, solving problems, multitasking and problems with their working memory. Scientific studies of the brain damage caused by alcoholism have consistently shown disproportionately greater deficits in executive and balance functions compared with other components of brain function. When researchers began to look at why these two functions were more affected by lesions created by heavy alcohol consumption, compared to others, they found a relationship between the deficits in the cerebellum and those of the prefrontal cortex. They found that the extent of cerebellar volume shrinkage was predictive of executive function deficits. In other words, if an alcoholic had problems with balance, he almost always had greater executive function deficits. For example, a shrinkage of the cerebellum (which controls balance), but not the parietal cortex, was a predictor for the loss of spatial visualization ability, which is the ability to mentally manipulate 2-dimensional and 3-dimensional figures. A Stanford University School of Medicine researcher theorized that the deficits caused by lesions in the prefrontal cortex and the cerebellum are compounded because the circuitry in the brain that the two regions use to communicate with each other is likewise damaged by shrinkage due to alcohol abuse. Information from the frontal cortex of the brain flows through the pons (see illustration above) to the cerebellum, while in the meantime, information from the cerebellum flows through the thalamus to the frontal cortex. Previous MRI studies of the brains of alcoholics found significant volume deficits in the cerebellar hemispheres and vermis, pons, and thalamus as well as the prefrontal, frontal, and parietal cortex. Professor Edith Sullivan's complex and detailed examination of the front-to-cerebellar circuitry of the brains of 25 nonamnesic alcoholic men found that each major node of the circuitry showed volume deficits from alcoholism. Sullivan found that disruption of these brain circuits could compound the deficits produced by shrinkage in the frontal cortex and the cerebellum either by interruption of the circuitry or by abnormalities found in the individual nodes themselves. The study also found that the cerebellum, through the brain circuitry, could significantly affect the function of the prefrontal cortex, perhaps explaining why a lack of balance in alcoholics was a predictor of a loss of executive function. The good news for chronic alcoholics is other studies have found that the brain shrinkage caused by alcoholism will begin to reverse itself when the alcoholic stops drinking. Bartsch, AJ, et al. "Manifestations of early brain recovery associated with abstinence from alcoholism." Brain December 2006. Mervis, CB, et al. "Visuospatial Construction." Journal of Human Genetics October 1999. Sullivan, EV. "Compromised Pontocerebellar and Cerebellothalamocortical Systems: Speculations on Their Contributions to Cognitive and Motor Impairment in Nonamnesic Alcoholism." Alcoholism: Clinical & Experimental Research September 2003.